Interesting fact: The Heliconius butterfly genus contains several of nature’s most striking examples of mimicry. Using the genome sequence of the “common postman” butterfly, H. melpomene, as a reference, an international consortium of researchers found that the nearly identical wing patterns of H. melpomene and other mimics such as, H. timareta and H. elevatus, were achieved through hybridization—a very rare phenomenon in animals. 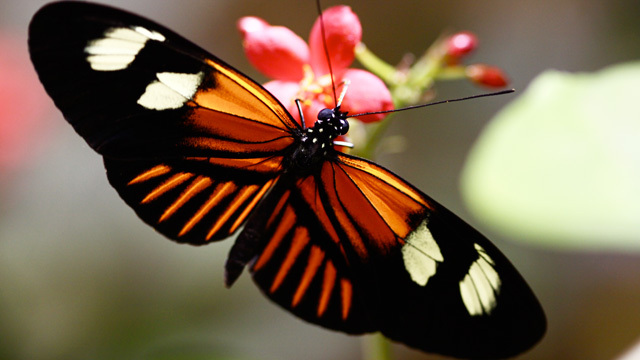 The Heliconius Genome Consortium, “Butterfly genome reveals promiscuous exchange of mimicry adaptations among species,” Nature, doi:10.1038/nature11041, 2012. Interesting fact: Exome sequencing of 112 prostate cancer tumors revealed what could be a distinct molecular subtype involving mutations in SPOP, a gene involved in transcriptional repression. Mutations in SPOP are present in up to 15 percent of prostate cancers and may be found in more than 25,000 men diagnosed with the disease in the United States every year—presenting a unique target for diagnosis and treatment. In a separate study, exome sequencing of an advanced and non-responsive type of the disease, known as metastatic castration-resistant prostate cancer, led to the identification of a novel set of mutations, including those in genes involved in androgen signaling, which could lead to a better understanding of the tumors’ resistance to therapy. C.E. Barbieri et al., “Exome sequencing identifies recurrent SPOP, FOXA1and MED12 mutations in prostate cancer,” Nature Genetics, doi:10.1038/ng.2279, 2012.C.S. Grasso, “The mutational landscape of lethal castration-resistant prostate cancer,” Nature, doi:10.10, 2012. 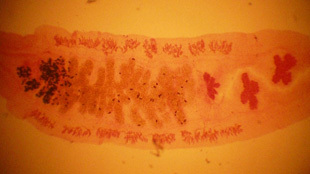 Interesting fact: The Southeast Asian liver fluke, Opisthorchis viverrini, is a flatworm parasite that infects the biliary and pancreatic ducts of humans and other mammals and can predispose those who are infected to a rare and lethal bile duct cancer known as Opisthorchis viverrini–related cholangiocarcinoma (CCA). Through whole exome sequencing of eight CCA tumors, researchers turned up 10 new genes previously unassociated with the disease that regulate histone modification, genome stability, and G protein signaling. C.K. Ong et al., “Exome sequencing of liver fluke–associated cholangiocarcinoma,” Nature Genetics, doi:10.1038/ng.2273, 2012. Interesting fact: Although the fist draft of the chimpanzee genome was published back in 2005, subsequent in-depth analyses of the chimp genome has since shed many insights into the evolution of the species, as well as its primate relatives. A recent comparison of the human genetic map with that of the chimpanzee—constructed using sequence data from 10 Western chimpanzees—revealed that although recombination rates are similar between the two species, recombination hotspots are markedly different. A. Auton et al., "A Fine-Scale Chimpanzee Genetic Map from Population Sequencing," Science, doi:10.1126/science.1216872, 2012. Interesting fact: The Chinese silver grass is an ornamental plant that’s closely related to staple crops such as corn, sorghum, and sugarcane. 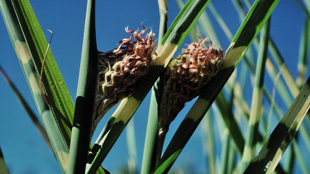 Using the genome sequence of the sugarcane as a reference, two independent groups of researchers created rough maps of M. sinensis’s 19 chromosomes, which will be useful in understanding the genetic basis of the plant’s desirable traits. The analysis also revealed that M. sinensis originated as the result of a duplication event in the sorghum genome. The full genome sequence of M. sinensis is expected to be published in the near future. K. Swaminathan, et. al., “A framework genetic map for Miscanthus sinensis from RNAseq-based markers shows recent tetraploidy,” BMC Genetics, 13:142, 2012.